The Voodoo drivers again came to Florida to do battle with each other and the drone folks. The three units that were the “best of the best” and arrived to compete were Oregon’s 142nd FIG (ANG), the 147th FIG from Texas (ANG), and a combined F-101 team representing the Canadian Forces. The action began as the teams arrived on the 31st of October. The competition wasn’t due to start for several days, but already the “Eager Beavers” of the Oregon ANG had their work cut out. One of their birds arrived “sick.” It had developed a serious engine oil leak that would require a transplant. The competition rules for William Tell do not allow any team to beg, borrow, or steal replacement equipment from any other team. In this case, spare engines are not normally brought along from the home base. What this means to a team is that they are in serious jeopardy of doing well in the competition when they have one aircraft less than the other competitors. Getting the replacement engine to Tyndall from Portland in time for the start of the Meet and in time for the shakedown flight was a tight race. A Guard transport C-130 from the California Air Guard at Van Nuys was dispatched to Portland to get the replacement engine. Waiting patiently was the six man ground crew tasked with the responsibility of transplanting the engine. MSgt Owen D. Hinkle, Flight Chief, and his merry band of five (MSgt Dennis R. Johnson, MSgt Clarence E. McIntosh, Jr., TSgt George L. Elser, TSgt Lane F. Homman [Hoffman], and SSgt Curtis A. Scott, the hurting aircraft’s Crew Chief) were practically scratching at the C-130 Hercules door by the time it rolled to a stop. The “Voodoo” surgical team rushed the new engine to the maintenance dock and with dedication, skill, pride, and the team spirit of competition, went to work in the early morning hours as the rest of the Nation waited for the final results of the Presidential election. By 0730, the engine transplant was completed and the trimming and fine tuning finished so that F-101 “Voodoo” with tail number 322 under the Oregon ANG marking was taxiing along with its four “Voodoo” team mates for the shakedown mission each participating team is allowed prior to the official start of William Tell. But when the task was successfully completed, the crew didn’t race to their barracks to sleep. They had to do some cleaning up – like removing the broken engine – so the regular base maintenance people could do their own work. The shakedown mission was over by the time the 142nd FIG all-night team finished their labors. The Oregonians were ready for the competition. Lady luck was also to take pot shots at the Canadians. They were thwarted in their effort to pull ahead of the Oregonians when one of their machines also malfunctioned. The hot shooting “Voodoo” crew consisting of team captain Lt Col Al Sundvall and his navigator, Capt Paddy O’Sullivan, both from Chatham, New Brunswick, were only twenty seconds from missile launch on their low-level, towed target when the fire-warning light in the cockpit of their supersonic interceptor came on. Sundvall immediately shut down the engine and was forced to break off his attack. The crew brought the aircraft safely back to the base. The full impact of the incident was discovered after the safe return to Tyndall. An explosion in the engine had caused the engine seizure and resultant fire. The fire was extinguished by Sundvall’s quick reaction and shutting down of the engine. One engine panel, unique to the aircraft, had a gaping hole in it with nearly 50 percent of the panel blown away. Blown away also were numerous points lost because of the mission failure. According to the competition rules, the aircraft has to be repaired before its next mission. Normally, a two-or three-day job, the Canadian ground crewmen accomplished the engine change and aircraft repairs in 12 hours. The aircraft was test flown successfully only 24 hours after the incident and the team continued their challenge into the final mission profile of the Bicentennial William Tell Meet. Such feats are indicative of the skills and determination of air and ground crews in the competition. 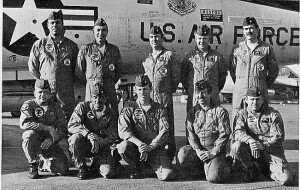 When it was over, the “Eager Beavers” of the Oregon Air National Guard’s 142nd FIG had ignored the rain and clouds over the William Tell aerial gunnery range to lock themselves into first place in the F-101 category. The Oregonians piled up enough points on their Profile III mission to mathematically knock all of the other F-101 teams out of the competition. During their Profile III mission against a “Firebee” drone, the “Eager Beavers” met their scheduled takeoff times and pointed their all-weather interceptors through the thunderheads and rain to find the elusive targets. The bad weather didn’t deter them from racking up their highest scores and taking the F-101 title beyond the reach of the Canadian Forces Air Defence team. The final flight by the Oregon Air Guard team was flown almost to perfection with three of the four aircraft scoring the maximum 625 points each and the fourth scoring 525. The two-seated F-101 “Voodoo” interceptors from Oregon were flown by team captain, Lt Col Martin T. Bergan and his weapons systems officer (WSO), Maj William H. Morse; Lt Col Jerry 0. Clark and his WSO, Maj Carl L. Perks; Maj Brad A. Newell and his WSO, Lt Col Donald R. Tanole [Tonole]; and Capt John L. Fisher and his WSO, Maj Robert E. Tracy. All of the aircrewmen were from Portland, Oregon. Another unique aspect of the Oregonian team was that, unlike all the other teams in the competition, the 142nd FIG team used enlisted personnel as their weapons controllers, who from their radar consoles on the ground at Tyndall AFB, located the flying target, notified the interceptor and directed the intercept. 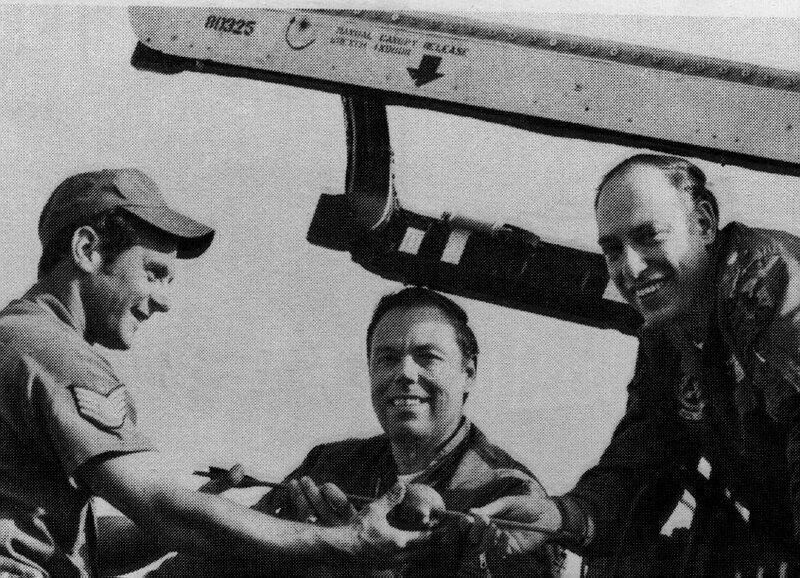 The “Eager Beavers” weapons controller team consisted of TSgt Hank L. Coble, Jr., and TSgt Michael P. Schmitz of Tacoma, Washington; and their controller technicians, Cpl Allan J. Currie of Drumheller, Alberta (on exchange duty from the Canadian Forces), and A1C James H. Miller, Jr., of Whitehall Pennsylvania. The weapons controllers scored 870 points of a possible 900 on their team’s final mission. There are no bands and cheerleaders; the arena is almost 100 miles away from Tyndall; and the meet takes place in a tri-dimensional area 125 miles by 175 miles by 50,000 feet. No fans see the competition held in the blue skies above the Gulf of Mexico. The score is verified only by judges flying in supersonic aircraft and by electronic and optical computers designed to register scoring hits. It’s the biennial “William Tell ’76” meet named after the Swiss archer whose exercise of freedom caused his apple-splitting feat to become a legend to freedom lovers down through history. William Tell ’76 has all the aspects of fierce competition among highly trained teams flying sophisticated supersonic aircraft. Yet it is not a game. The effort and objectives of the meet revolve around the deadly serious mission of defending the skies over the North American continent and in many areas of the free world. William Tell simulates combat in that the participants know they may be called upon at any time to engage target aircraft trying to penetrate their home area. William Tell is a practice in survival…. survival of the aircrew but also survival of those who depend upon the air defense forces. It is a practice competition for winning a battle in which second place is disaster. It is a meet with a mission. Four separate profiles are flown, each incorporating a different target or tactic of aerial interception. Everything is scored – weapons controllers at their radar scopes, aircraft maintenance, and weapons systems technicians. The overall team performance contributes to a team’s point total. Each interceptor will be guided by its ground control team for a front, head-to-head attack against a drone target flying at medium altitude above 400 knots. The aircraft and drone target will be approaching each other at combined speeds of almost 900 knots. The pilot will be required to track the target by a prescribed distance. Airborne detection, however, is much greater than this. After the pilot acquires and tracks the target, missiles or rockets will be launched at the proper distance. Usually, this distance is determined by on-board computers, depending on altitude, speed, closure rates, and attack geometry. If the first attack does not destroy the target drone, the pilot will reattack by repositioning aircraft for a stern attack. The stern attack requires the interceptor crew to make hard turns, generally, in excess of 3 Gs, (or three times the normal body weight). If the reattack is successful, another missile or rocket can be fired with a minimum of target travel distance. Each interceptor will be committed on a stern attack on a low altitude, towed target at an unspecified altitude. The towed target, either the TDU-25, for the F-101 and F-106, or the TDU-9 for the F-4, is a small unpowered fiberglass target towed behind an F-101 on 26,000 feet of cable. The TDU-25 incorporates a constant heat source to simulate the infrared radiation of a jet aircraft. The TDU-9 incorporates a traveling wave tube to provide a constant source of energy for radar missiles. Infrared missiles are fired at the TDU-25 and radar missiles at the TDU-9. Like their powered big brother, the Firebee, it has radar reflectors to make it appear bomber size target on radar scopes. This profile uses, for the first time, the BQM-34F, a supersonic drone, and is designed as a minimum time intercept from a scramble status. Each interceptor will be committed on a front attack against a high-altitude Firebee. Target altitude will be 50,000 feet minimum at mach 1.2. Each aircraft will be allowed only one engagement against the target. No armament will be fired on this mission. Targets will be manned EB-57s and F-101 aircraft equipped with radar detection devices (jammers and chaff) and radar confusing devices. These targets will be difficult to find since their altitude and speed will be unknown until the fighters are airborne. The attack geometry will vary depending on altitude and angle from which the fighter attacks. To make this profile even more difficult, radar ground control teams will be required to commit two fighters simultaneously against the EB-57 and F-101. Profile IV for the F-4 will require the identification of a Firebee by tail number before receiving permission to fire. A pair of F-4s (Eyeball and Shooter) will depart in formation, with the Eyeball identifying the large number painted on the tail of the drone. The Shooter will position for a stern firing position. If the number called to the ground by the Eyeball is correct, a cleared to arm and fire will be called. At that time, the drone target will begin a 3G turn and the shooter will fire, attempting to destroy the drone. Scores of these four profiles will be pooled for the team score. Other scored items will be radar intercept directions, radio transmission, and takeoff times. Radar intercept directors manning automated or manual command and control consoles at the Air Defense Weapons Center at Tyndall will be scored on their ability to guide the interceptors to the target. The judges for the William Tell Competition are tasked with computing scores, deciding points, and arbitrating disputes to choose the winning teams for the weapons meet. Their decisions are final.